Your cute, small newborn baby is already starting to grow up. Learning is the key at this stage in a child’s life. Now it is time to increase intelligence, develop coordination, learn colors, and more. Fisher-Price helps children learn early in life. It doesn’t matter if it is their ABCs or 123s learning is the key in life. This will help your child learn and have fun at the same time. 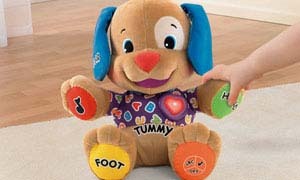 Play games, sing songs and enjoy lots of learning fun with this huggable Laugh & Learn Love to Play Puppy friend. This adorable plush puppy responds to baby’s touch with music, sweet sayings, and 10 sing-along songs! Puppy’s interactive content introduces baby to the alphabet, numbers, counting parts of the body, colors and more. Ages: 6-36 months. The Fisher-Price Laugh & Learn Love to Play Puppy helps to promote baby’s fine motor skills with a light-up heart, paws, tummy and ear, each responding to baby’s touch while encouraging his eye-hand coordination. In addition, baby’s sensory development is strengthened through Puppy’s soft, plush exterior, light-up heart and sing-along songs. Musical fun and games include Itsy-Bitsy Spider, Pat-a-Cake, a special “I Love You” song, and more.Academics are explored through lessons on letters, numbers, feelings, parts of the body and so much more! How does it help my child develop? Promoting social and emotional development, developing new skills helps build self-confidence. Invite baby to learn through singing and playing. Point out Puppy’s body parts and then show baby where her tummy, ears and heart are—especially when Puppy sings Head, Shoulders, Knees and Toes! She’ll be making connections and learning new things in a fun way. Introducing letters, numbers, counting, parts of the body, feelings and more encourages baby to play in a fun and imaginative way! Watching their faces light up as they explore, discover, play … all those moments when children learn best. That’s why Fisher-Price builds learning into everything we make. With playful ways to engage curious minds, exercise little bodies, and nurture budding personalities. Because nothing’s more amazing than sharing the joy of learning with your child. Includes Fisher-Price Laugh & Learn Love to Play Puppy and 3 AA (R6) 1.5V batteries. When replacing, use LR6 alkaline batteries.